US security officials and Jewish community leaders prepare for Rosh Hashanah, Yom Kippur in the face of rising terror threat. JTA - In a pre-Rosh Hashanah briefing, Jewish community and U.S. security officials urged Jewish institutions to be resilient and keep up morale in the face of terrorist threats. Hundreds of officials from more than one hundred institutions across the country participated in the call on Friday. Speakers included Paul Goldenberg, the director of Secure Community Networks, the security arm of the Jewish Federations of North America, and top Department of Homeland Security official whose identity SCN declined to reveal to the media. The speakers briefed listeners on recent terrorist attacks, including last week’s series of bombings in the New York-New Jersey area believed to have been carried out by an Afghanistan-born American man. One of the bombs injured 29 people. In addition to reviewing security procedures, including training staff on how to deal with active shooters, and establishing relationships with local police, Goldenberg emphasized that U.S. Jewish institutions should continue business as usual, and keep security unobtrusive so it does not hinder High Holy Day worship. “We have come to learn that the goal of terrorists is to wear down our citizens’ spirits and endurance, destroying national morale,” he said. 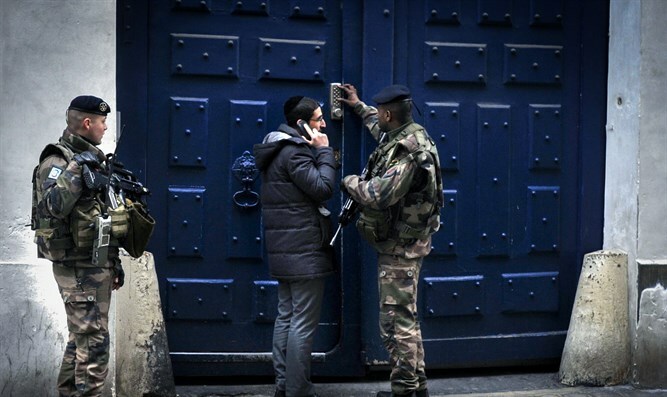 Goldenberg said on the conference call that the barricades placed around Jewish worship in Europe have created a psychology of being under siege. “According to a recent poll, nearly 70 percent of European Jews may decide not to attend High Holy Days services this year,” he said. One key, he said, was for the public not to panic or demand drastic changes in national policies. Terrorists “recognize that if their attacks cause large-scale mobilization of the public to put pressure on their governments to change policies or positions, they could indeed enjoy agenda-setting powers over a democratic society,” he told the conference call.